After becoming India's most trusted Fast Moving Consumer Goods brand, Yoga guru Baba Ramdev's Patanjali on Sunday entered the telecom sector. At an event, Baba Ramdev launched Swadeshi Samriddhi SIM cards, in alliance with Bharat Sanchar Nigam Limited (BSNL). Initially, only the employees and office bearers of Patanjali will be able to avail the benefits of the SIM card. 1. The special plan will come with benefits such as free unlimited voice calls without roaming charges, 2 GB of data per day and 100 SMSes per day for the respective validity period, according to BSNL. 2. BSNL is offering a validity period of 30 days, 180 days and 365 days in denominations of Rs. 144, Rs. 792 and Rs. 1,584 respectively. Free voice calling, data and SMS benefits apply for the validity period according to the plan chosen by the subscriber. 3. For example, a user subscribing to the Patanjali Swadeshi Samriddhi SIM card with the plan of Rs. 144 will get 60 GB of data with a daily limit of 2 GBs, among other benefits, for a period of 30 days. However, a subscriber of the Rs. 792 denomination will get a total of 360 GBs of data over 180 days, with a daily limit of 2 GBs. 4. The Swadeshi Samriddhi SIM card was launched by yoga guru Ramdev last Sunday. The SIM card, available to Patanjali Ayurved staff, for now, will be available to the general public soon. 5. 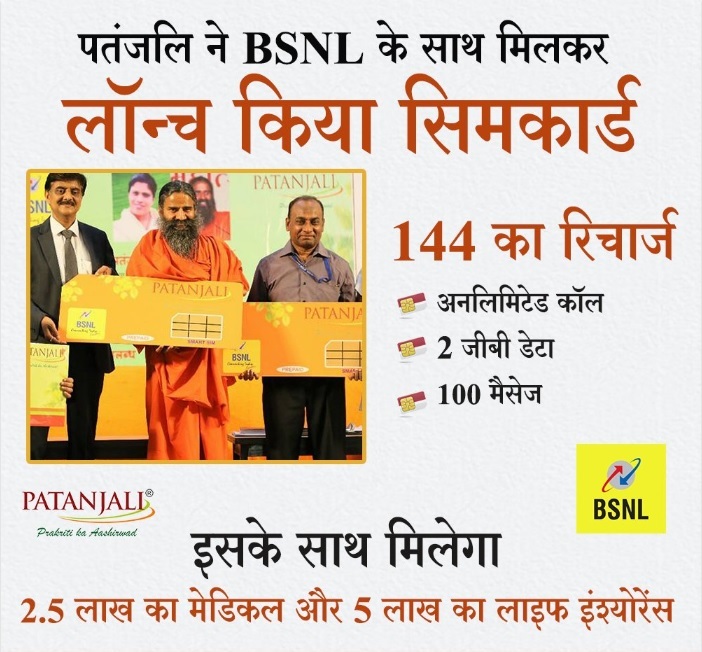 BSNL said the special plan is available "for members of Patanjali organizations like Bharat Swabhiman Nyas, Patanjali Yog Samiti, Mahila Prakostha, Yuva Bharat, Patanjali Kisan Seva, Swadeshi Samrudhi Card Holder". For activation, eligible persons are required to visit the nearest CSC or retailer along with valid documents such as Patanjali employee ID, according to BSNL. 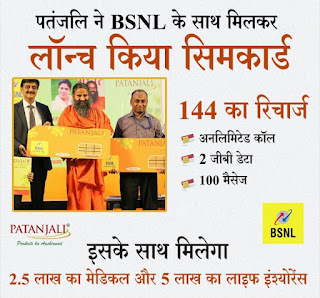 “…Those who are not members of Patanjali Family can subscribe and buy Swadeshi Samriddhi card of Patanjali and produce the same to buy BSN Patanjali 144 Plan. Swadeshi Samriddhi card of Patanjali also gives life insurance cover of Rs. 5 lakh and accident insurance cover of Rs. 2.5 lakh,” the telecom company added. The country's telecom sector is witnessing high competition since the entry of Reliance Jio. Bharti Airtel currently offers a recharge pack at Rs. 249. This pack comes with 2 GB of data per day along with free voice calls, among other benefits, for a validity period of 28 days. Rival telecom company Reliance Jio offers a recharge pack at Rs. 198, which comes with unlimited voice calls and 2 GB of high-speed data for a validity period of 28 days, among other benefits. Vodafone India offers 2 GBs of 4G/3G speed data for a validity period of 28 days in a recharge pack priced at Rs. 255. Other benefits include unlimited voice calls. Currently, Patanjali Ayurved offers a wide range of products from segments such as food, ayurvedic medicine, cosmetics, home care and personal care products. Patanjali Ayurved had formally launched its e-commerce operations with website Patanjaliayurved.net earlier this year.